Kellogg Community College students, staff and community members will bring the action, adventure, comedy and music of the high seas to Battle Creek this weekend with the opening of the College’s spring musical on Friday. 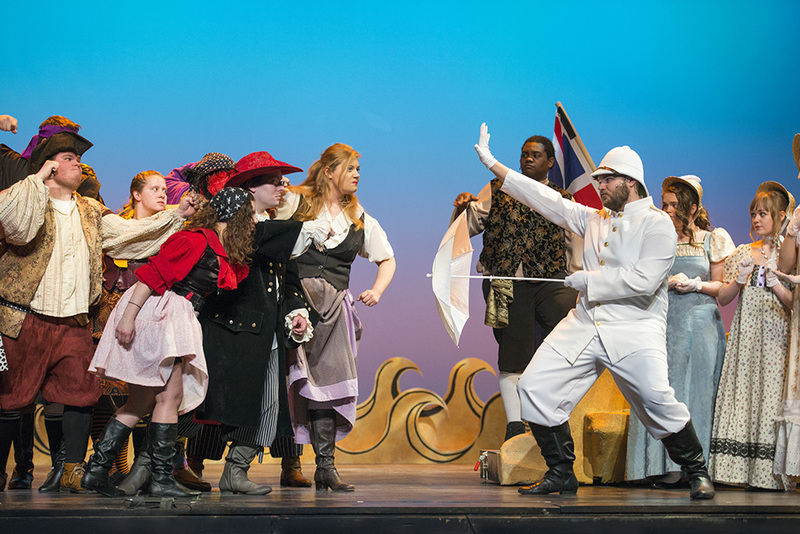 The College will present Gilbert and Sullivan’s “The Pirates of Penzance” at 7:30 p.m. March 20, at the newly renovated Binda Performing Arts Center, on campus at 450 North Ave., Battle Creek. Additional 7:30 p.m. showings will be held at the Binda on Saturday, March 21, and Friday and Saturday, March 27 and 28; 3 p.m. showings will be offered on Sundays, March 22 and 29. A collaboration between the theatre and music areas of KCC’s Arts and Communication Department, “Pirates” is directed by theatre coordinator and professor Brad Poer, with Dr. Gerald Blanchard, vocal music director and music coordinator at the College, serving as music director. The musical includes a cast of more than 30 performers and a full orchestra, the latter led by KCC trumpet instructor Eric Campbell. Blanchard called the show a bridge between the two worlds of theatre and music. The show is one of the first fully produced theatre productions to be presented in KCC’s Binda center since a $4.1 million renovation project was completed last fall, which doubled the size of the lobby, improved acoustics and other functional aspects of the theatre space and allowed for the integration of updated lighting and sound technologies. KCC’s Opera Theatre Ensemble presented “Amahl and the Night Visitors” at the center in December; a “low-budget” theatre production titled “Sampled Shakespeare” was presented in November. Tickets for KCC’s “Pirates of Penzance” are $10 each for members of the general public or $5 for KCC students, staff and seniors. To make reservations or for more information about the production, call 269-965-4154. Members of the media with questions about the show may contact the show’s director, KCC theatre coordinator and professor Brad Poer, at poerb@kellogg.edu, or the show’s music director, KCC vocal music director and music coordinator Dr. Gerald Blanchard at blanchardg@kellogg.edu. High-resolution images of the cast may be downloaded for use by the media from the KCC Theatre presents “The Pirates of Penzance” album on the College’s Flickr page. For additional images, alternative sizes or resolutions, or for subject identification or caption information, contact KCC digital writer/marketer Simon A. Thalmann at thalmanns@kellogg.edu.